I am not a boatman or yachtsman by any means but a photographer constantly seeking beauty of any kind. I discovered beauty by chance on a recent visit to the IYRS in Newport. An image in the Boston Globe drew me to this magical place located on Narragansett Bay. Founded in 1992, the school powers careers in the marine industry and includes both the main campus in Newport (which I visited) and a satellite campus in Bristol. 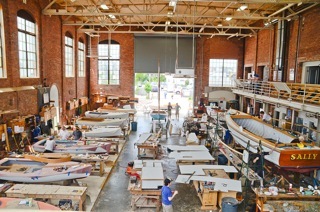 Its boating and restoration programs play an important role in Rhode Island’s workforce development. 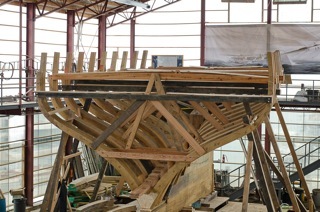 As an international school, the focus is on preparing students to excel in all aspects of modern wooden boatbuilding. Restoration Hall is its waterfront building serving as the school’s main teaching facility. It has been refitted as an open space where students work on their projects. The Coronet Building, next to Restoration Hall, is the site of the current reconstruction of the 1885 schooner of the same name. Located along the coast where boating is a major part of the local culture and commerce, IYRS is a vibrant maritime center to be enjoyed by students and visitors alike. An elevated catwalk allows visitors to observe craftsmen down below. It is quite an experience to witness both the building of small boats and the restoration of classic large vessels to their former glory and usefulness. Students demonstrate that honest work, integrity and mastery of a craft are among life’s greatest achievements and joys. Graduates of the programs use this specialized training as a launch pad for a wide range of career paths.